A midwinter beach trip makes perfect sense in the context of this barrier island’s history. When the Jekyll Island Club opened in January 1888, it was a hunting and fishing escape for Northern industrialists, including J.P. Morgan, Joseph Pulitzer, Marshall Field, and William Vanderbilt. Many members built “cottages” near the clubhouse, and today these stately homes and the club hotel encompass a National Historic Landmark District. During the “Holiday Island” festivities, you’ll find live oaks draped with Spanish moss instead of evergreens in tinsel—as well as plenty of traditional activities. For the holidays, the entire district is decked out in full-on Victoriana. Explore decorated homes during daily “Holidays in History” tours (912-635-4036). 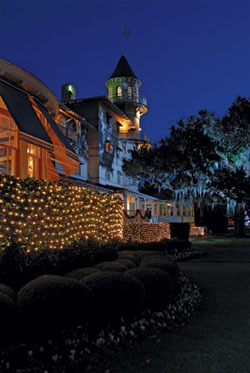 The Jekyll Island Club Hotel (right) hosts a number of events, including caroling, gingerbread making, and a December 12 “Dickens Feast” paired with a performance of A Christmas Carol (912-635-2600, ext. 1062). A perfect way to compensate for holiday overindulgence is to take a walk on the unspoiled ten-mile beach, or attend a nature walk hosted by the UGA 4-H Tidelands Nature Center (912-635-5032). At the Georgia Sea Turtle Center (912-635-4444, georgiaseaturtlecenter.org), stranded turtles are nursed back to health. Santa will visit the amphibious patients during a special event on December 19. Nothing beats the original Jekyll Island Club Hotel (371 Riverview Drive, 800-535-9547, jekyllclub.com). Most rooms in the vintage structure are unique, so take some time to chat with the reservationist about the details. On a recent visit, we happily overlooked a tiny bathroom and the lack of a closet (there was a small armoire) in exchange for a charming glassed-in sunporch that offered a private and spectacular view. Some rooms have fireplaces, others have luxe baths, and some have both; it pays to ask. If you’re bringing the whole family, rent a cottage or condo through Jekyll Realty (912-635-3301, jekyll-island.com). At press time, we found three-bedroom rentals for December in the range of about $600 to $1,600 per week. Even if you don’t stay at the historic hotel, book a reservation for dinner or high tea and indulge in the subdued elegance of the Grand Dining Room (800-535-9547, jekyllclub.com), where windows showcase a sweeping riverfront vista. At Latitude 31 (912-635-3800) on the historic district wharf, order the oysters Rockefeller in honor of one of the Jekyll Island Club founders. If the weather is good, opt for a Lowcountry boil at the adjoining Rah Bar. “Are the shrimp local?” we asked our waitress. “If you consider that boat there local, yes,” she said, gesturing grandly toward the end of the dock. >> For updates on Jekyll Island development and revitalization, visit jekyllisland.com/news.